We simply don’t tell you often enough how important you are to the United Irish Cultural Center. Thank you ! We continue to be inspired by your generous support over the years. 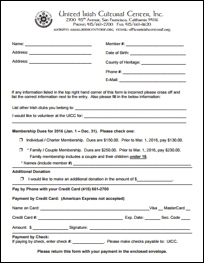 In addition to your 2019 membership dues, before December 31 please consider making a tax-deductible charitable contribution (see reverse). The United Irish Cultural Center has been a special place in San Francisco for 45 years – hosting family celebrations, weddings, music, dances, St. Patrick’s Day, club gatherings, re-unions, literary events and even boxing matches. In the recent past, the UICC has hosted diverse events regarding San Francisco’s role in the 1916 Rising; the accomplishments of Kate Kennedy as an advocate for worker’s rights & women’s rights, early morning GAA games broadcast live, the murals of Belfast photo exhibit, UICC Scholarships to students, the Rose of Tralee event, Shalom Ireland in partnership with Congregation Beth Israel Judea, the St. Patrick’s Day block party, and the Soul of the Potato with the Peruvian and Irish Consul Generals. This year the UICC has hosted the Irish Football Youth League, the Irish Literary Historical Society, the United Irish Societies, the Irish American Unity Conference, the Gaelic Athletic League, Cork Sister City, Comhaltas Ceoltóirí Éireann (the Society of Musicians of Ireland), the Rose of Tralee, the Rebel Cork Benevolent Association of San Francisco, and the Eugene O’Neill Foundation. As we look to the future, we hope to build on this legacy, to expand Irish cultural activities, and to engage a new generation in the spirit of being Irish in San Francisco. That vision includes improving the space we have by renovating the St. Francis Room and Library, creating better, more versatile rooms for meetings and lectures, installing Audio Visual/Networking equipment, and installing the fastest internet connection on the west side of San Francisco. We also would like to dream about a new building that would include community meeting rooms, offices, performing arts space, library, history museum, exercise studio, and lecture hall. However, our vision is not just for a building, but to create and expand our sense of community. To do this, we would like to provide a space for other Irish organizations, as well as Irish and Irish/American writers, musicians, athletes, storytellers and entrepreneurs – all under one roof. We know that you care deeply about the future of this organization and its broad cultural mission. We need your support now more than ever. Please know that gifts of all sizes make a difference. With your generous tax-deductible contribution to the Center we can make foster and promote Irish exceptionalism for our children and future generations of Irish Americans here in San Francisco.